I have opportunity to buy an used Silent Partner eStringer DG for about $160 ... 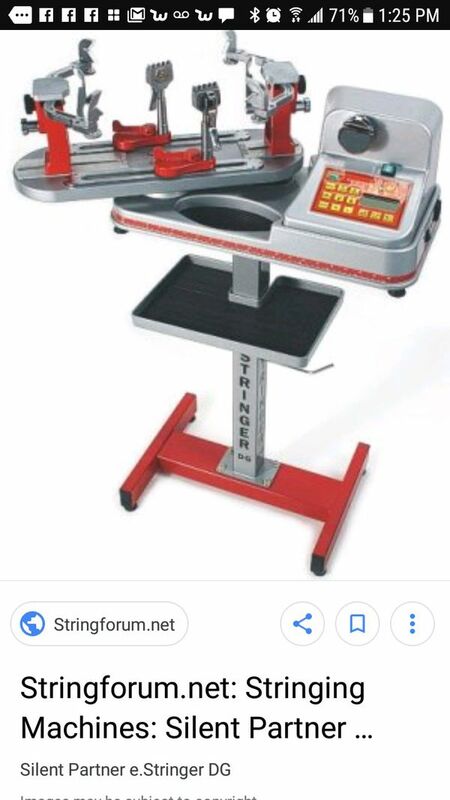 I remember SP back in the day when I lived in Europe and was never able to buy one back then, it seems they have stopped selling stringing machines. At this price point, would this machine be worth it for this price? It's cheaper than even a Klipper and it seems to be much better no? If the electronics crap out or are already crapped out what is your plan for keeping the machine going? I havent seen it yet but according to seller machine is stringing well and is calibrated. If anything have a problem in the future, it will be a huge junk. My stringing machine (opus) was broken and send it to fix. Spend almost $500. Received the machine and broken again (within a week). They wanted me to send back, it will cost another $300 for shipping alone and they can not guarantee to fix. My option might be...bring this machine to tennis machine in person and replace entire alternative electronic system. I think it depends what $160 is worth to you. Assuming it works, you could ask what else you could get for that money. Not a lot. How many string jobs would it need to get through to make it worthwhile? Again, not a lot. Were it priced more expensively, I'd pass. If $160 isn't at least somewhat trivial to you, I'd also pass. But if you can get a guarantee that it's fully functional at present and worst case scenario could afford to write off the $160, then it might be worth a gamble. However, if it did die, I would be very hesitant to invest further trying to repair it. If the table, base clamps and clamps are in good shape, you'd probably be able to sell the parts on the bay and make money. I wouldn’t touch that with a 10 foot pole. The electronics are the concern - once those go, you are SOL. The interchangeability of clamps and bases across brands is spotty at best. It is, basically, a free machine, compared to pricing of new machines with similar capabilities. If you do not have to pay for shipping, and it works, why not take it? Call tennis machines and ask them about potential repairs is needed. Exactly, you'll be saving $10-? per string job so if you get 16 string jobs out of it you come out ahead. If it works perfectly, I think it's worth it for $160. You'd recoup your money after just a few string jobs, and it would be better than anything else for the price. Now if the electronics ever poop the bed, I wouldn't put any money into getting it fixed (if it was even possible), as that would cost more than the stringer is even worth. And even then, you could still sell it for the turntable, mounts, clamps, stand....someone could probably remove the tension head and slap a Wise on their using the dropweight adapter. I think Silent Partner went out of business several years ago. It looks solid, but it doesn't look easy to convert to say, a Wise head. I wouldn't do it. This was exactly my thought! For $160 if you can string 20 paid jobs on that thing you'll be in the black! I say go for it, assuming they aren't lying to you about its condition. Yeah, Silent Partner is just doing ball machines now, and have been out of the stringing machine business for a minute. It might not be too difficult to do a conversion. Take a look at this pic and it looks like the whole electronics/tension assembly is a separate unit. So unbolt that, then drill new holes and use a Wise dropweight adapter. But even if that's not the case, still wouldn't change my opinion that it's a worthwhile purchase if it's working a-okay. if that helps to convert back to a crank or upgrade to a Wise. You in the Philly area?